“Sprinkles” (Trek to the Manger, chapter 12) may look lovely on cupcakes, but they can be a real obstacle to peace and faithfulness for the follower of Christ. In one gloriously productive day, my husband and I succeeded at clearing out one stall in our garage. It wasn’t the first time we had spent hours in pursuit of empty space, but we were thrilled to finally be able to park a car INSIDE the garage (it did help that we finally have a car small enough for our modest space)! We hauled away a van load of cast-offs to Goodwill that day – things which we had accumulated over the years that had long since either lost their usefulness or had simply been outgrown. Some of what we gave away hadn’t done time outside of the garage in an embarrassingly long period of time. We piled up a lot of trash during our cleaning frenzy. Some we can recycle. Some cardboard boxes we gave away to a friend who needs them for an upcoming move. Tomorrow a whole bunch of bags and boxes will find their way to the curb for the garbage truck to haul them away. Some of the things that have taken up space in our garage for years are good for nothing but the trash heap. We filled up one box with items that should have been in the house, being put to good use. I brought in a collection of home videos filmed over the past 17 years that had been quietly collecting dust, some office supplies that will save a trip to the store, a few books worth adding to the keepers on the shelf and some brand new toys that we had never given as gifts. Some of what we hold onto gets lost in the graveyard of useless things when we amass large quantities of stuff that we just can’t keep track of. More isn’t always more. Sometimes more is just too much. I don’t always subscribe to the tradition of making promises to myself in the New Year. Resolutions, in my limited experience, tend to guilt me within weeks of making them rather than spurring me on to good works. I had no intention of falling into that trap again – that is, until I pulled my car into the garage for the first time last week. The timing was incredible! Our work day was terrifically warm for December, and dry so that we could spill out into the driveway as we sorted and stacked and separated our excesses. But even as we turned the key in the ignition, snow began to fall – softly at first, but eventually resulting in an uncharacteristically messy winter storm. A winter storm that my little car didn’t have to endure because we had made room for it in the space where it belongs. So I’ve decided that there really is just one thing tugging at me as the New Year looms again. I’m tired of seeing so much stuff crammed into places where it simply does not belong. Trash and junk and outgrown toys in the garage, where the car ought to be. Unworn and poorly fitting clothing in the closet, where the things I actually will wear ought to be. Calendars and schedule books littered with tedious meetings and pointless commitments, where satisfying and rewarding activities ought to be. Worries and stressors and disturbing emotions taking up head and heart space, where joy and direction and clarity most definitely ought to be. This year, I’m resolving to pass along to others the things that I have that they need. This year, I’m resolving to throw away those things that are not worth keeping and are not worth giving away. This year, I’m resolving to put to good use those things that I knew I would need someday. This year, I’m resolving to MAKE ROOM in my house, in my head, in my life for that which really ought to be there instead. And who knows? Maybe God has been patiently waiting on me to do just that. After all, how can He pour new life and living water into the space within when it’s already jam-packed-full of something other than His very best for me? 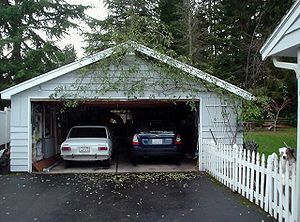 A car belongs in its garage. That’s what the space is for. I can’t wait to see what God has in mind for the space we’re about to create… in me! My church family recently welcomed a new member to our staff. As Adam was introducing himself to us, he said something that lodged in my brain and hasn’t stopped pinging since. He said that God creates order from chaos. Now, I don’t know what you see. Is Iraq War Today’s Vietnam? And those are just a sampling from the media. You could add your own headlines, couldn’t you? Diagnosis: Cancer. Stage 3 Cancer. I don’t know what YOU see, but the word chaos is a pretty apt description of much of what goes on around us on any given day. The prophet Jeremiah saw this, too, and he used words like ‘violence and destruction’, and ‘terror is all around’ to describe it (Jeremiah 20:7-13). Now, these are not band-aid words Jesus is speaking! The natural progression of the universe is from order to disorder. In the same way that nature moves toward disorder, nature’s tendency is to move toward lower energy. Order requires energy – to stack a pile of blocks takes much more energy than to crash that same pile, right? To organize a deck of cards by suit takes more energy than a game of 52 card pick-up! Order requires energy, but nature tends toward that which requires lower energy, SO… nature tends to move toward disorder. This is also called ‘entropy‘. This explains a lot, doesn’t it? It explains why diets almost always fail – because it takes a lot more energy to order our lives in healthful ways than it does to reach for a bag of chips from our favorite spot in front of the tv. It explains why self-help is often no help at all, because our physical nature leans towards inaction when left to our own devices. As complex as we humans are, we will fall prey to the 2nd Law of Thermodynamics every time, as long as we rely on ourselves to initiate change. This is why disorder and chaos are more likely to occur in nature – and in the world as we each see it – because nothing in nature is able to create or maintain itself. Without an external influence, we will land in chaos and disorder every time. It’s the LAW! This is exactly what Jesus is talking about when He says that there are those who seek life in THIS world – a life of fulfillment for themselves, HERE and NOW – in a world where the most probable state for any natural system is one of disorder. The 2nd Law of Thermodynamics says that all systems degenerate when left to themselves. And Jesus says those who find this kind of life will end up losing it in the end. Unaided by God, human beings are no different than any other natural system. Left to our own devices, we will follow the path of our addiction, affection or greed every time. Want life in THIS world, Jesus asks? Wrap your arms around entropy. Are you ready for some GOOD news? Well, buckle up! Because entropy can be lowered and disorder can be affected by external action – by the transfer of energy from a source OUTSIDE itself! This is where Romans chapter 6 comes in and bridges the gap between chaos and order, between the laws of nature and the Laws of the Kingdom of God. Hear this good news, but try thinking of sin as the 2nd Law of Thermodynamics – a state of mindlessly doing what the world wants us to do. Going through the motions. Apart from God. Do you see it NOW? Jesus is the energy source that pulls us out of the chaos and into a life that doesn’t end in death! When we are willing to let this earthly life go, for Jesus’ sake, that’s where true life is found! That’s when we experience FOR OURSELVES – firsthand – that God is at work, creating ORDER out of chaos! This act of Jesus, his death and resurrection, his transfer of energy and life, WORKS because we are LIVING SYSTEMS… And living systems are OPEN systems, meaning that energy can transfer in and out. In living systems, this transfer of energy is called HEAT! God’s presence works in us to counteract our natural tendency toward cooling off, toward randomness, toward chaos, disorder and sin. Oh my gosh, think PENTECOST! Ever wonder why the tongues of fire? Pentecost was God’s own object lesson in heat transfer ! His Spirit’s energy moved in, burning off the ties to this physical world so that men and women could finally live free from the laws of sin and death! Amen?! ALL of which constitute SIN, by the way. Romans 6 says we are no longer slaves to it! We are no longer slaves to this chaotic, disorderly world because the power of God has acted on our very existence, transferring HEAT! FIRE! ENERGY! Empowering you and me to see and do and become well-ordered, beautiful things in Christ Jesus! How hard is it for people to be “one” – completely unified in heart and mind? Is Jesus praying an IMPOSSIBLE prayer? We can look around the world and see MANY examples of disunity and disagreement; in fact, most of us needn’t look any further than our own families to see just how difficult it is for people to become “one”. God ordained for the two to become one in marriage, but the divorce rate in America sits between 41-73%, depending on whether we’re talking first, second or third marriages. (http://www.divorcerate.org/) If TWO people fail more often than they succeed at creating unity between them, how in the world can we even HOPE to see the church “become one” in mind and spirit?! I have to believe that Jesus wouldn’t lift up idle prayers that He knew full well would not be answerable by God. He was one with God – His Father! He already KNEW what God desired for these followers of His. Jesus had to be praying for unity and one-ness among us, knowing that such a thing could be achieved with God. In a world where even Christians can’t agree, however, don’t you have to ask yourself whether Jesus was crazy to talk about unity as if it could ever really happen? And it starts with a CAR. YOU, behind the wheel of a car. What KIND of car it is doesn’t matter, because in America it’s about what that car REPRESENTS –INDEPENDENCE, FREEDOM OF CHOICE, and CONTROL. At the end of each school year we celebrate those who are completing 12 years of education. This milestone is often misinterpreted as an ENDING – a celebration of something that is now OVER – rather than a celebration of the journey as it CONTINUES in a new and different FORM. Many grads can’t resist the temptation to jump into their “cars” and drive AWAY – doing their own thing now that they’ve “graduated” – and let’s face it: ALL OF US know the THRILL of being captain of our own ship, even if the ‘ship’ says Chevrolet or Honda on the bumper! First of all, a Cable Car does not have its own POWER source. There is no motor inside, and on its own, it’s nothing more than a cool looking car that isn’t going ANYWHERE anytime soon. Secondly, a Cable Car runs on a specific path. This route was pre-determined when the tracks were put in place and there aren’t options like “hang a left at the next block” unless the track already goes that way. You might say this track is narrow, and there is no doubt as to where it leads. Also, a Cable Car has lots of room for different kinds of passengers. You can sit inside if you don’t want to be windblown or get wet when it’s raining. You can stand in the back and have a great view of what’s behind, or sit in front to see what’s coming up ahead. People on the sides enjoy the open air and can experience the city as it goes by, and frequent stops allow new people to jump on and others to climb off, because we still have that choice – even on a Cable Car – don’t we? There is a limit to the number of passengers at one time, though, because the car won’t operate correctly with too much weight or too many bodies on board. 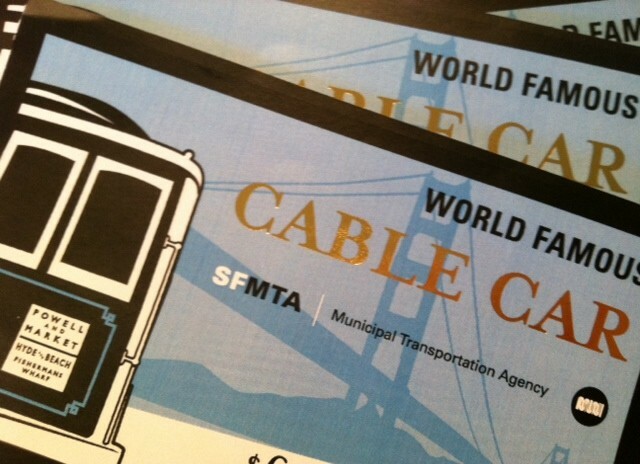 So – what makes a Cable Car move? Where is the POWER if not in the car itself? This was the coolest thing for me – walking across the street, over the tracks, and hearing the steady hum of the cable moving underneath! That cable is ALWAYS in motion. When a Cable Car is stopped, it’s because the car has become disconnected from the cable, but the cable itself DOES NOT STOP. When the car is moving, it’s because it is connected to the cable. Now, there are multiple cars in various locations on any given route, but the moment one of those cars connects to the cable, it is going the SAME SPEED as every OTHER car along the path. This is because the cable itself is always moving at 9 ½ miles per hour. You can’t have a “fast” car or a “slower” car on this route – the cable keeps things steady and reliable, and the speed of the cable is always the same. As you might expect, it takes a trained operator to run a Cable Car – someone who knows the mechanics of connecting the car itself to the cable in order for it to move. 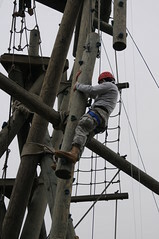 There are multiple levers to manage, and it looked to me like it took some STRENGTH to do this job! Especially on the steep San Francisco streets. We need to realize that there are AUTHENTIC Cable Cars & authentic families of faith. They don’t just LOOK LIKE the “real thing”, but they are genuine both in DESIGN and FUNCTION. An authentic Cable Car, like the authentic Christian Church, has no power in itself. Only when connected to the steady cable, to the power of the Living God, can there be any movement or progress made. The Cable Car designer laid the tracks, and there is no doubt as to where they lead. You can be sure that ‘wide is the road that leads to destruction’, but if you want to take THAT route, you’re going to need to step OFF of the Cable Car and get into your Ford, because WE who are onboard KNOW WHERE WE ARE GOING! There is more than one Cable Car on the tracks and more than one Church on the block, traveling the same route. A variety of people are in each car, and sometimes they come & sometimes they GO. Sometimes they switch cars. But we’re still on the same path as long as we GET INTO THE CAR! You can only fit so many bodies into the Cable Car before the car (& the operator!) get stressed. There are limits for safety and limits for proper function of the car… and of the Church. If a Cable Car stops its forward progress, it’s because the operator and passengers made the decision to stop. The cable keeps going, and so does God. Every car connected to the cable will go the same speed, full speed ahead, at 9 ½ mph. That’s the speed of the cable. No one can boast that their car is faster and covering more ground, or that their car is slower, allowing more passengers to jump on. God – like the cable – remains the same. Trained operators are needed on the Cable Cars and in the church. It’s not that they know MORE than the passengers, but their function is to keep a strong connection with the power source, so that the car can move and the people aboard can be themselves – passengers on a journey together, powered and directed by a Designer who knows, though it may sound crazy, that WITH HIM, ALL of His people actually can be ONE.